Back for another quick review today. 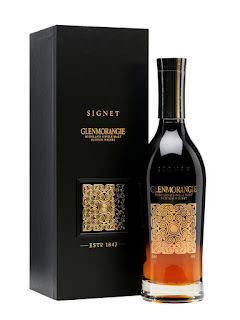 This one is the Glenmorangie Signet. Have I reviewed any Glenmorangie here yet? No? Oh, well they've got the tallest stills in Scotland but nothing has ever really interested me that much to try or buy many of them. Apart from the 12yo Portwood finish, which is lovely stuff I got on a deal. So what's the deal with this Signet thing? It's a bit different and I'd heard good things from various sources. It's at a higher strength, partly Sherry matured (I think) and part of the whisky is made from chocolate malt (normally reserved for brewing, not distilling). However, it's also NAS, fancifully packaged and has a higher price tag, so let's proceed with caution. Taste: Very soft arrival, light with marzipan and chocolate, expensive truffle chocolates, slightly earthy. Finish: Medium length. Loads of chocolate, dark chocolate and chocolate truffles. Don't know if my brain has unconsciously processed the chocolate malt info and made my find more chocolate but this is a pretty delicious whisky. For the price though, I think I'd be disappointed if I'd bought a bottle. Thanks for reading! More coming up.